Is the energy price cap working for the market? Ofgem’s price cap update has finally been announced, with many industry analysts proven right about an increase of £100 or more. As wholesale costs rise, is the cap worth it? On Thursday 7 February, the energy regulator announced the default price cap on standard variable tariffs is to rise by £117 to £1,254 a year, affecting around 11 million customers. The price cap for prepayment meter customers, meanwhile, will increase by £106 to £1,242 a year for the same period of a six-month “summer” price cap. The new levels will come into effect on 1 April and will be reviewed later in the year. At the time of writing, five of the largest energy suppliers – Eon, EDF, Npower, British Gas and Scottish Power – had all announced they would raise their default prices in line with the revised cap. We are told, by some, that customers are being protected and that a price cap means a better deal for society’s most vulnerable. But is this a fair assumption? According to Ofgem, the caps will continue to ensure that the 15 million households protected “pay a fair price for their energy, because the rises announced reflect a genuine increase in underlying energy costs rather than supplier profiteering”. Indeed, the regulator’s chief executive Dermot Nolan, says: “Under the caps, households on default tariffs are protected and will always pay a fair price for their energy, even though the levels will increase from 1 April. A long-standing critic of the price cap is the chief executive of big six supplier Eon UK, Michael Lewis. Speaking at Utility Week Congress in Birmingham last October, Lewis said Eon had concerns that intervening in the market this way “brings the danger” of reducing customer engagement and could “ultimately be counter­productive” in driving forward the new energy agenda for customers. According to Lewis, there are three important factors: wholesale costs, operational costs and headroom. The recent rise has also left some questioning the level of the protection the cap provides for customers. Stephen Murray, energy expert at price comparison website MoneySuperMarket, calls the cap increase a “significant blow” to millions of households relying on the cap to save them money. “The cap was put in place to protect consumers from overpaying on their energy, but right now it’s doing anything but that,” he says. “It’s only taken five weeks for it all to unravel, and households up and down the country will be scratching their heads in confusion and wondering how the claims of ‘fair prices’ and ‘£76 per year saving’ have disappeared – and so quickly. Adam Scorer, chief executive of fuel poverty charity National Energy Action, is also concerned. He warns that the recent freezing weather, coupled with the likely energy company responses to the higher caps, will have a “hugely damaging” impact on the most vulnerable in our society. “While Ofgem’s caps are required to reflect the underlying costs of supplying energy, higher prices will inevitably pile yet more pressure on the millions who have no choice but to suffer in cold and dangerous homes,” he says. Figures published by Ofgem show how rising wholesale costs were the driving force behind the increase. Furthermore a certain Beast from the East caused high demand for gas last March. 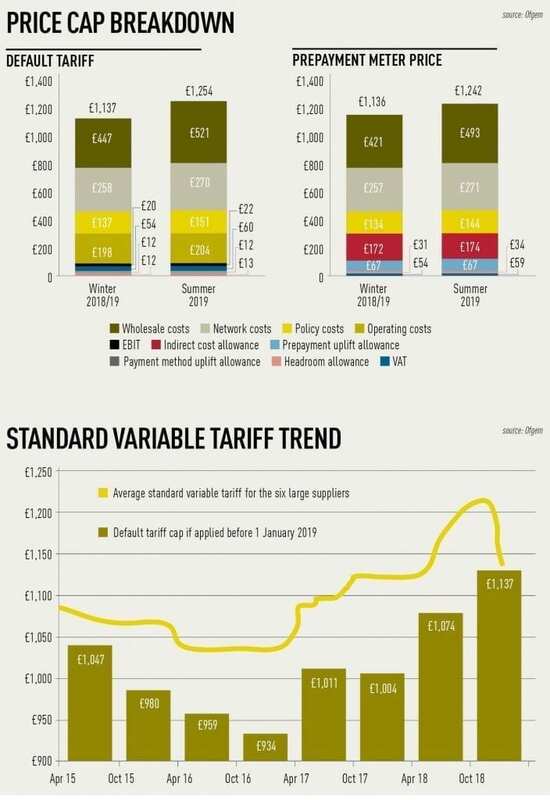 The industry regulator says that around £74 of the £117 increase in the default tariff cap is due to higher wholesale energy costs, which make up more than a third (£521) of the overall cap. Network costs account for the second biggest element of the overall cap (£270), while operating costs are responsible for £204. Higher wholesale energy costs have similarly pushed up the level of the prepayment meter cap, Ofgem says. Despite the significant rise, industry analysts are already predicting the cap will fall when it is updated in October. Research from analysts at Cornwall Insight suggests that, with wholesale cost pressures starting to fall, its predictions for winter 2019 indicate that the cap is likely to be reduced by around £50, assuming wholesale costs remain at the same level the market experienced at the end of January. Robert Buckley, head of retail and relationship development at Cornwall Insight, says: “The announcement comes as little surprise because built into the price cap design was the possibility of upwards movement in response to changing market conditions. Despite the upward movement in the cap, wholesale prices have been falling recently and this could impact the next change to the cap. This, of course, is an early forecast and assumes wholesale costs will remain at the same level seen in January. A key factor in the implementation of the cap was the perception that energy companies, especially the larger retailers, may be profiteering from their most vulnerable customers. Yet even before the initial level of the cap – which was set at £1,137 – came into effect on 1 January this year, there had been mixed views on whether it really offers the best protection for consumers. Some commentators have pointed out that prices would have probably risen anyway, regardless of the cap, because of the rise in wholesale costs. Forbes adds that the price cap rise shows that whoever sets energy prices – Ofgem, local authority suppliers or larger suppliers – there is no “magic formula” to control rising wholesale costs. And it’s not just concerns about consumer protection that have been voiced; the cap has also already been blamed for triggering restructuring at more than one of the UK’s largest energy retailers. Npower is the most recent supplier to blame job losses on the cap. At the end of January it announced that around 900 jobs would go as a result of “extremely tough UK retail energy market conditions”. The big six supplier, which has a workforce of 6,300, has recently announced it is introducing a programme to reduce operating costs, largely due to the price cap and intense competition on fixed price tariffs. Paul Coffey, Npower’s chief executive, believes the energy retail market is “incredibly tough” and points out that the regulator itself forecasts that five of the big six will make a loss or less than normal profits this year due to the implementation of the cap. Like Forbes, Coffey warns that the recent failures of smaller energy suppliers are an indication that many have been pricing at levels which are not sustainable. However, in its announcement, Npower added that, as a result of natural wastage, the number of redundancies in the business will be “considerably lower” than the 900-strong cut to its workforce announced – around 900 employees leave the company annually, for retirement or another job. Citing an “increasingly competitive environment”, fellow big six supplier Eon said in July 2018 that it was looking to reduce numbers across non-customer facing departments as part of its ongoing efforts to transform how the business operates, improve efficiency and continue to innovate in the service that it offers customers. The energy price cap is a temporary measure imposed by the government in response to concerns about “greedy” suppliers squeezing their customers for profit. Yet no-one can deny that the hike in wholesale costs leaves the regulator with no option but to raise the cap – and indeed for suppliers to raise their tariffs. At a time when companies are considering cutting jobs to make ends meet, it does beg the question: is forcing suppliers to cap prices really the best idea?